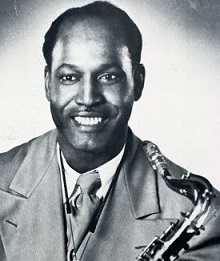 Influential saxophonist who never seemed able to connect commercially with the musical style he helped point the way towards with his earliest forays. Big Jim Wynn began his career in the mid-1940’s and was among the many with a claim to creating or expanding on the popularity of the ubiquitous hit “Ee-Bobaliba” (a/k/a “Be-Baba-Leba” for Helen Humes, or “Hey! Bob-A-Re-Bop” for Lionel Hampton). His later effort “Rock Woogie” was another formative pre-rock side that hinted at the style around the corner. More notable however was his flamboyant stage show in which he left the stage to parade through the crowds or laid on his back while blowing up a storm, putting on a show that was highly visual and almost lewd in its unrestrained exuberance. His records largely failed to capture this excitement even when rock came along providing the perfect format for his antics. Unable to take advantage of the tenor sax instrumental craze that dominated the late 40’s rock scene commercially, Wynn increasingly turned to backing others both in studio and especially on stage, eventually re-uniting with longtime friend, blues giant T-Bone Walker, another renowned showman, as his on stage foil, as well as being a frequent bandleader for rock ‘n’ roll package tours throughout the 1950’s. By the early 1970’s Wynn’s act was a featured highlight of Johnny Otis’s revival concerts that brought back stars of the 1940’s and 50’s rock, blues and jazz scenes. Wynn died in the summer of 1977 at the age of 69.